The temperature is dropping, the stress is increasing, and winter break is just around the corner. 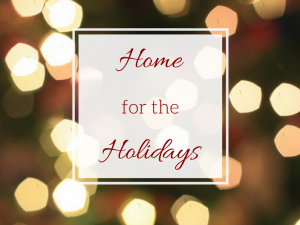 Most everyone is looking forward to heading home for the holidays, and if that sounds like you, it sure makes sense. Home-cooked meals, old friends, and zero responsibility sounds like a complete blast and a half. But what if you’re not exactly ecstatic about leaving? For many of us, coming home means work. It means struggling to get acclimated once again to living at home. We love our parents, but living under the constraint of their rules after experiencing pure freedom at college is sure tough. And don’t even get me started on siblings. Again, we love them to death, but they know just how to push our buttons, don’t they? Winter break comes with an abundance of holidays. Usually the holidays are pretty great, there’s a delicious food, high spirits, and family members. Family members. You know, the aunt you never see is suddenly sitting at the table, and she just won’t let up about you not having a love interest. Or your grandparents bombard you with questions about every aspect of your personal life. And, of course, someone just HAS to bring up politics at the dinner table. Don’t you love it? Most of all, going home for winter break means that you are leaving the place that houses an abundance of fond memories. You’re leaving the place that holds unexplainable moments with irreplaceable friends. Leaving for home means that you’re leaving home. But don’t worry! Although BG will soon be in your rearview mirror, it won’t be too long until you’re back! Embrace and learn from the struggle that going home brings, and return ready to make spring semester the best one yet!